A new study came out that studing the game of Sudoku and the logic involved with processing the variables could gain valuable insight into the world of artificial intelligence. Sudoku (? ?, s?doku? ), also known as Number Place or Nanpure, is a logic-based placement puzzle. 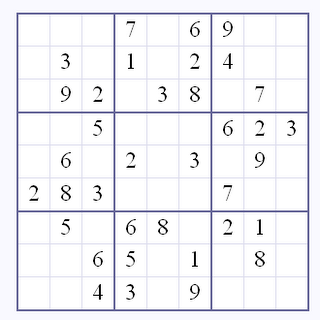 The aim of the puzzle is to enter a numerical digit from 1 through 9 in each cell of a 9×9 grid made up of 3×3 subgrids (called “regions”), starting with various digits given in some cells (the “givens”); each row, column, and region must contain only one instance of each numeral. Completing the puzzle requires patience and logical ability. In another study conducted by Professional Web Services, Inc., it was discovered that playing Sudoku helps in your Internet marketing intelligence. A daily dose of Sudoku helps the brain create new neurons to increase the level of understanding, through neural linking, into what is taking place on the Internet. EEGS have shown the brain has a heightened spike in the level of increased electrical neural activity immediately during and after playing the game. The residual memory affect on high level brain functions is a 75% increase in the baseline after one hour of playing Sudoku. 24 hours later, the baseline is maintained at a 25% increase from the first evaluation. Thereafter, on subsequent 24 hour measurements, the level of drop is not as great as the first day drop in the baseline. Measurements show only a 10% decrease from the previous 24 hour period measurements. Seven days after the initial test, the subject is still at a 7.7% increase from where they initially started. Further Internet marketing intelligence studies are ongoing at the Internet Marketing Industry Blog. Professional Web Services, Inc. offers strategic Internet marketing services, ethical SEO – Search Engine Optimization, online advertising strategies, blog marketing services, and Web branding solutions. Get your business discovered on the Internet. Contact Professional Web Services today to get a free online marketing evaluation.